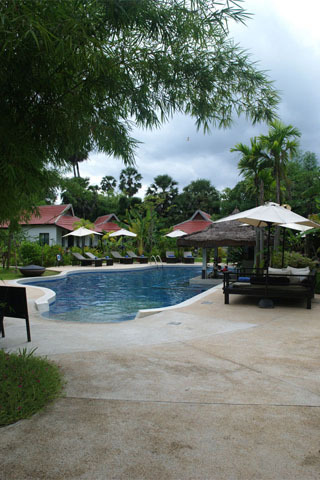 Set beside a lovely Khmer village about a mile out of town, and a decent, but rarely visited ancient temple, Wat Athvea, Sojourn should appeal to those who want to get away from the hustle and bustle of Siem Reap but also want a high-end place to stay. Average rating 9 from 199 reviews. Nine bungalows are buried in mature gardens bursting with birds of paradise, hibiscus, frangipani and more, and surround a medium-sized pool, with swim-up bar, and there are two rooms in the main building too. The rooms are beautifully designed, with lots of strong, clean lines that don’t become overly masculine. All the usual bells and whistles are there, including WiFi, TV, air-con, minibar, safety box and hairdryer. There are thoughtful touches like book exchange book bundles, umbrellas outside the door, and an iron with ironing board. The bathrooms are fantastic; made in terrazzo, they boast a huge bathtub and rainfall shower. The more expensive temple villas also have an outside shower. The food has a great reputation, and the Australian owners can do a barbecue like no one else can if you’re lucky enough to be around for one. They grow a lot of their own vegetables and herbs, and have been composting their kitchen waste for years. Each villa has its own porch that looks onto the pool, which is perfect for an early morning coffee, or sundown cocktail. We found the staff to be really helpful and friendly. In-room spa services are available, but they also have their own Origins Spa (not related to the beauty brand name), which offers a wide and exotic range of massages, facials, scrubs and wraps. The owners of Sojourn also own Beyond Unique, a tour company that has a fantastic reputation for developing and implementing cultural tours that will immerse you, as much or as little as you like, into Cambodian life, from cooking classes to a Day in a Life Village Experience. They are very welcoming for families and say they are able to offer great options for younger children (12 years and under) in the rooms. Rates include breakfast, pick-up and drop-off. Check rates at Sojourn Boutique Villas on Booking.com.